Buying your first home will likely be one of the biggest decisions you make in your life, so it’s important to get it right. The whole process can seem fairly confusing and stressful, but it doesn’t have to be! Jade Turnstill, Digital Marketing and Communications Executive for Share to Buy, the UK’s leading online portal for Shared Ownership properties, shares her top five tips for first time buyers looking to get a foot on the property ladder. A good location can make or break your first home, so it’s imperative to do your research. Get the lowdown from locals – find out shortcuts to the supermarkets, busy times for the local pubs, and the best day to try and get a doctor’s appointment. Visit the area at different times of the day; find out how busy your morning commute could be, and how loud Friday nights can get. Test out the transport links – how long does it take you to catch a train or tube? Is there a bus stop nearby, and where do the busses go? The number one rule is: never commit to an area unless you can imagine yourself living there. One of the best aspects of buying your own home is being able to decorate however you want! For insta-worthy interiors, some serious thought needs to go into your décor. Pinterest is perfect for creating online mood boards – pin your favourite colour schemes, furniture styles and artworks to your pinboard. This means that when it comes to homeware shopping, you’ll have a much clearer idea of what you’re looking for. Top tip: Purple is back in! Inspired by Pantone’s colour of the year, ‘ultra violet’ is a must-have for your new home. We all know that buying a home for the first time is a huge financial commitment, and it’s no secret that deposits, particularly in the capital, can be sky high. However, help is at hand with Shared Ownership, especially as the part buy/part rent scheme usually requires a significantly lower deposit than purchasing on the open market. In fact, our research here at Share to Buy shows that average Shared Ownership deposits are less than a third of London’s open market deposit requirements! Don’t forget it’s not just the deposit that you need to be saving for. Make sure you’re factoring in mortgage arrangement fees, solicitors fees, council tax, utility bills and insurance. This might mean tightening the purse strings for a little while. Try and cut down on day-to-day spending on non-essentials – we’re talking new clothes, eating out every lunchtime, and picking up a coffee on your way to the office each morning. Did you know: the average Brit spends over £2,000 a year in coffee shops! If you are buying a Shared Ownership home – or any home for that matter – it’s vital to make sure that you are happy with the housing provider or developer. Find reviews online, follow their social media pages, and speak to friends who have dealt with the company before. There are a plethora of fantastic housing providers across London – you just need to find the right one for you. Still stumped? 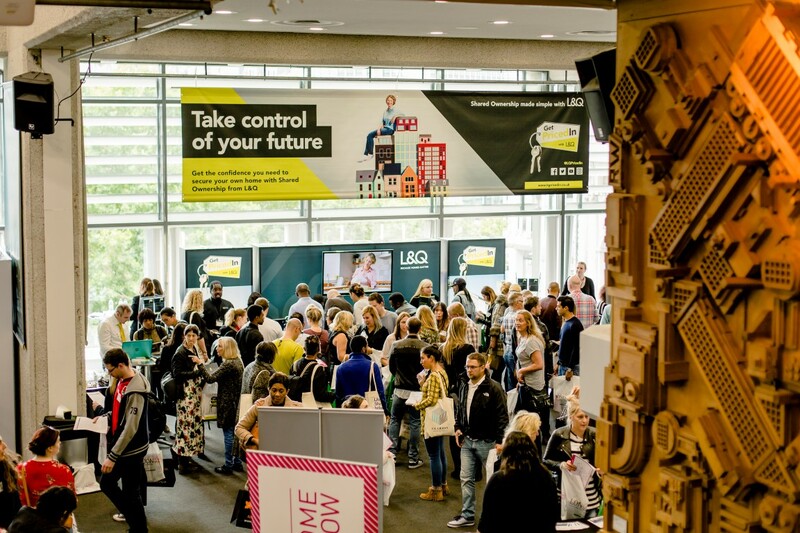 The London Home Show, which will take place on the 22nd September 2018 at London’s QEII Centre, is the perfect place to meet some of the capital’s top providers of Shared Ownership and Help to Buy. You’ve done your research and saved your money – now it’s time to enjoy your new home! Packing and moving boxes may feel like a slog, but moving day is a time for celebration! Keep spirits up on the day with a ‘Moving House’ playlist, filled with all your favourite hits and a few themed songs; we’re thinking Moving On Up by M People and Celebration by Kool and the Gang. Once the hard work is all over, why not go and offer your new neighbours a glass of bubbly? It’s time to make the most of your very first home! Previous ArticleWhy is the UK having trouble keeping up with rent and mortgage payments?